Several thousand ducks take flight as sandhill cranes observe. After things settled down a refuge volunteer explained that a bald eagle had flown over the ducks, causing quite a stir. For several weeks in March, Monte Vista National Wildlife Refuge is the most important resting and re-fueling stop on the Greater sandhill crane migration path. 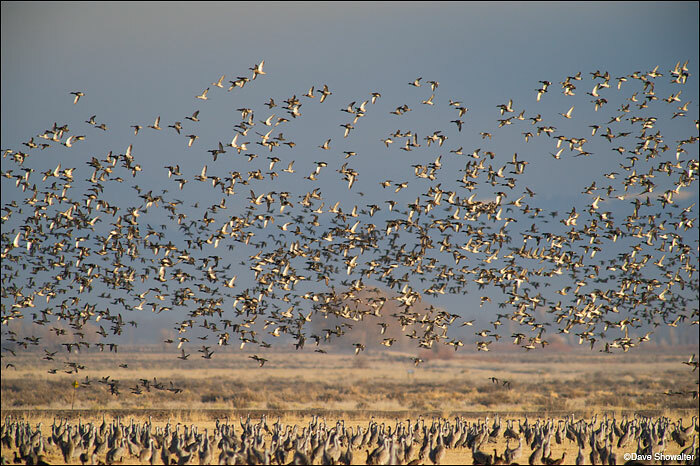 As many as 27,000 cranes travel from Bosque Del Apache NWR in New Mexico to the Greater Yellowstone Ecosystem and back in spring and fall. Photo © copyright by Dave Showalter.